In a city with discerning taste, we received recognition for our remarkable transformation from Marriott International in 2016. 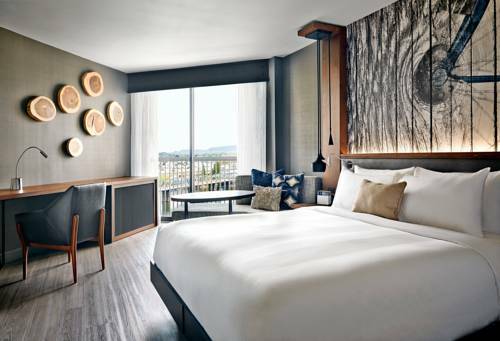 Set along the Willamette River, the Portland Marriott Downtown Waterfront features a bold look that celebrates the citys love of nature and its forward-thinking appeal. In the Greatroom, connect over free Wi-Fi and handcrafted cocktails, or retreat to the exclusive M Club Lounge, a space to work, dine and recharge. At Bistro by Truss, a locally inspired menu is paired with fine bourbons and whiskies. Redesigned guest rooms feature locally inspired art, platform beds, multi-use surfaces and spa-inspired bathrooms with a granite countertop and walk-in waterfall shower. Our hotel in Portland, Oregon offers easy access to top attractions, Portland State University and the outdoors at Waterfront Park. The fitness center offers a sleek alternative when Pacific Northwest weather hits. A downtown location and 38,744 square feet of event space make us a top choice for meetings. Let us dazzle your senses with a seasonal menu at our award-winning Portland waterfront restaurant. Showcasing the bounty of the Pacific and the artisanal riches of the Willamette and Columbia Valleys, Truss is available for private lunches or dinners. Whether it's in a private or communal ambiance in the morning or evening, the Bistro is the place to be and be seen. Enjoy Downtown Portland dining from early morning coffee to wonderfully crafted appetizers and artfully crafted cocktails.